Q. But does a cape really keep you dry? ​Q. What's the difference between a single and a double tier cape? A. Technically speaking, about 0.6m of fabric. But that's not the answer you're after.. The double tier cape is basically a single tier, but with a second, shorter layer of waxed cotton attached at the neck hanging to just below the shoulder. This gives a slightly fancier look - a 'tier', 'layer' or 'frill' of fabric. It is unlined to save weight and bulk, but will add a little extra warmth and rain protection, and will add a bit more to the silhouette of the cape. Have a look at the photo at the bottom of this page..
All capes colours currently come in single or double, except Dis Guys (camouflage). Q. Can I wash my cape in the washing machine? A. Only if you have one of the washable rain capes - these are the Brights collection - Pink Freud, Rubber Duckie and Coat D'Azur, or limited run Cape Noir. These can be washed at 30C with non-biological only. The oils and waxes in the material these capes are made from have been specially developed by British Millerain to be washable. 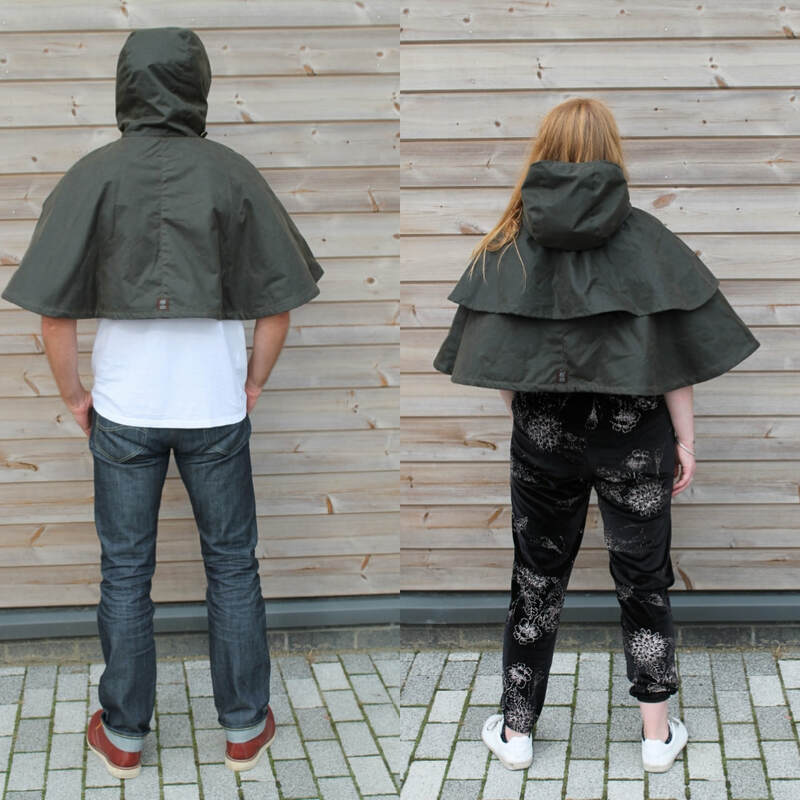 Standard waxed cotton rain capes may be dry brushed and sponge cleaned with cold or tepid water only. Harsh detergents will strip the waxes. Q. There are so many poppers - how I'm supposed to do up my cape? A. We have a You Tube tutorial to help - go to the Care tab on this website to watch it. Any questions, drop us a line! Q. I'm going to a festival at the weekend - will my cape come in time? A. It depends where you live, how many days before you order and how reliable and fast Royal Mail decide to be. Drop me a line before you order and I will do my best to get it to you in time. This might mean increasing the postage charge to get next day guaranteed delivery. Please remember I am a one woman operation and sometimes I might be away, but I'll do my best!